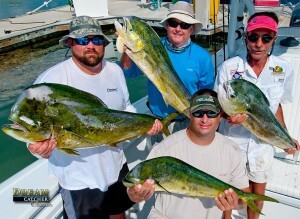 Keeping you up to date with the Key West fishing Dream Catcher Charters. Deep sea fishing off of Key West is producing stellar results. With the controlling South East winds we have prime conditions for deep sea fishing and the fishing has been outstanding. Weed lines are huge and there is a ton of baitfish around with lots a frigate birds monitoring the progress of the feeding pelagic community. The weather has been a little sporty in the last few weeks with winds in the 15- 20 range regularly. But like many seasoned deep sea fishing captains say. 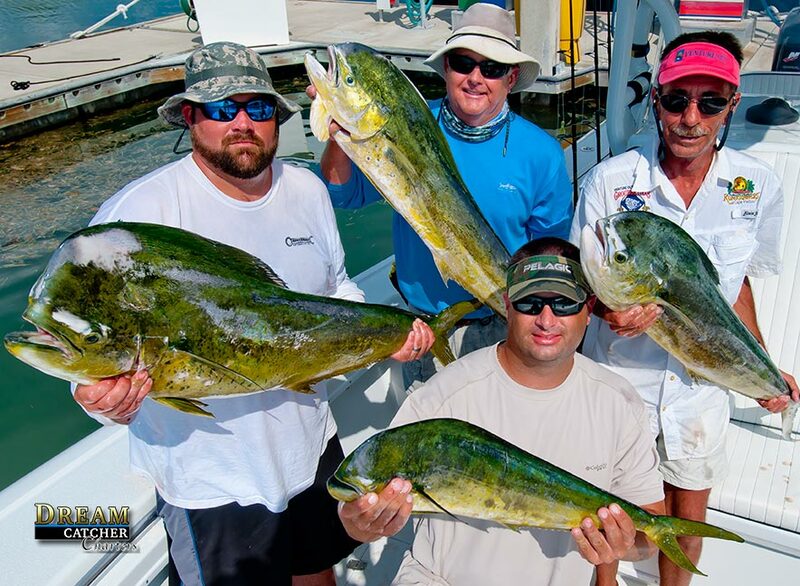 Rough waters are best waters for catching quality trophy fish here out of Key West. Many reports of super sized 40 and 50 lb dolphin are coming to the docks here in Key West daily. With the added bonus of some White and Blue marlin releases as well as some large wahoo on the troll. On the deep drop snowy and yellow edge grouper are making the box pretty colorful with mixes of tile fish and rose fish. Deep sea fishing should only get better in the coming weeks with the full moon coming up, the low pressure system over the South West Gulf of Mexico and the stirred up waters from fresh 20 mph breezes. We expect the deep sea fishing to keep up and stay steady. To tell us about your group and we can help you decide on a boat.